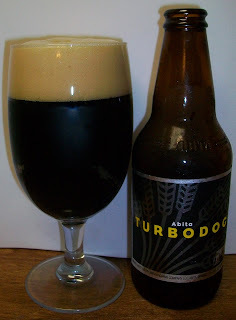 Abita Turbodog is a dark brown ale brewed with Willamette hops and a combination of British pale, crystal and chocolate malts. This combination gives Turbodog its rich body and color and a sweet chocolate-toffee like flavor. I was at State Line Liquors looking for the Abita Pecan Harvest but I was too late. Matt recommended this one so I figured that I would give it a whirl. The beer pours a dark brown almost completely opaque with just a hint of deep ruby hues showing through the glass. The beer also produced a fairly rich tan head. The nose is nice with rich toasted malt aromas with earthy undertones, nutty notes and light floral hops aromas. What a nice brown ale with rich malt flavors but still maintaining a smooth and refreshing mouthfeel and body. It starts out with a caramel malt sweetness up front followed by a nice almost creamy mouthfeel in the middle of the sip. The back end is pretty easy drinking for a brown ale with an almost effortless swallow. There is malt robustness that builds during swallow into the finish. This robustness diminishes however at the finish. The finish is nice, smooth, almost creamy with rich toasted malt flavors and a touch earthiness from the hops. There is just a slight lingering of toasted malts on the final aftertaste. This is a really nice Brown Ale. I can’t tell you how impressed I am this one, rich but still smooth and almost refreshing. I’ve been doing more drinking than writing so I am going to let this sit and warm up a little. OK, I let this sit for a while; we are now at 66 degrees. Man O Man is that good! This beer was good before but now it’s exquisite. The warm malts are richer but much smoother now. There is a silky smoothness, almost creaminess to this Brown Ale. This delicious Brown Ale went from a B to an A in the last few sips. What a great character development in the last few degrees. This is one Brown Ale that I highly recommend. First of all I need to tell you that if you are looking or a real beer expert then you are still looking because it’s not me. I’m just a regular guy sharing his opinions and enthusiasm for craft beer. The Belgian styles are my favorites but I do appreciate all styles of craft beer. That is, beers that took some craftsmanship and artistry to produce. This blog is still a work in process so we’ll just have to see what happens with it. Please use the search function and labels below for ease of navigation. Generally the reviews are written as I’m experiencing that beer. I try to capture character development etc. as the beer warms up. I also try to evaluate a beer based on its individual style. I try to keep this all light and humorous. The only problem with that is, my English ain’t so good so it don’t come off liken I means it. So welcome to my beer madness. We are here to share our growing knowledge and enthusiasm of craft beers. Keep it light, have fun and we will all learn a little more about this wonderful world of craft beer. For more about John and this blog, Click Here. For more about my reviewing style, Click Here. It is all a matter of taste; your personal taste. Just because I or someone else thinks a beer is good, it doesn’t mean that it’s good for you. Beer Advocate - Respect Beer.